VATICAN CITY – The pope’s chief liturgist, Monsignor Guido Marini, endorsed calls in the church for a “reform of the reform” of Catholic liturgy. “For some years now, several voices have been heard within church circles talking about the necessity of a new liturgical renewal,” Monsignor Marini said. A fresh renewal movement would be “capable of operating a reform of the reform, or rather, move one more step ahead in understanding the authentic spirit of the liturgy and its celebration,” he said. Monsignor Marini, who has served as master of papal liturgical ceremonies since late 2007, spoke Jan. 6 to a conference of priests from English-speaking countries gathered in Rome to mark the Year for Priests. The conference was sponsored by the Australian Confraternity of Catholic Clergy and the U.S.- based Confraternity of Catholic Clergy. Monsignor Marini stressed that the liturgy celebrated by the church should be marked by historical continuity. Monsignor Marini said that an appreciation of continuity would help bring together divergent schools of thought regarding the liturgy. “The liturgy cannot and must not be an opportunity for conflict between those who find good only in that which came before us, and those who, on the contrary, almost always find wrong in what came before,” he said. The way forward for any liturgical renewal is “to regard both the present and the past liturgy of the church as one patrimony in continuous development,” he said. He offered suggestions for showing continuity in the liturgy and gave examples from current papal liturgical celebrations. The tradition of praying while facing East, and so symbolically facing the Lord, is now seen in the placement of a crucifix on the altar of St. Peter’s Basilica, he said. “Hence the reason for the proposal made by then-Cardinal Ratzinger and presently reaffirmed during the course of his pontificate, to place the crucifix on the center of the altar, in order that all, during the celebration of the liturgy, may concretely face and look upon the Lord, in such a way as to orient also their prayer and hearts,” he said. A renewed emphasis on “adoration,” explained by Monsignor Marini as “union with God,” also will foster continuity with the past and should be a criterion for future liturgical practices, he said. Everything in the liturgy must be conducive to adoration, Monsignor Marini said, including the music, the singing, the periods of silence, the way of proclaiming the Scriptures as well as the liturgical vestments and the sacred vessels. He said it was this same desire to renew a sense of adoration that prompted Pope Benedict to make it the norm in papal liturgies for the pope to distribute Communion on the tongue to people kneeling. 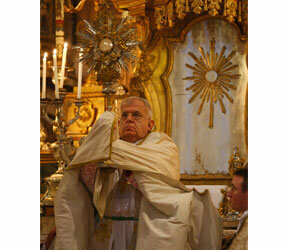 Throughout his talk Monsignor Marini quoted extensively from the writings of Pope Benedict concerning the liturgy. “I have learned to deepen my knowledge these past two years in service to our Holy Father, Benedict XVI. He is an authentic master of the spirit of the liturgy, whether by his teaching or by the example he gives in the celebration of the sacred rites,” Monsignor Marini said.